The King of Prussia and the final Kaiser (Emperor) of Germany, Wilhelm II ruled from 1888 until 1918 and was largely responsible for Germany's involvement in World War I. 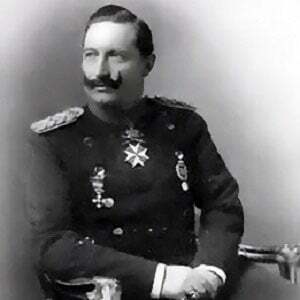 A highly unpopular figure, he was forced to abandon the throne in late 1918, at which point he fled to the Netherlands. Following the 1888 death of Emperor Wilhelm I, then-Prince Wilhelm's dying father was briefly Emperor before the prince assumed the title of Wilhelm II at the age of twenty-nine. By most accounts, he was somewhat hot-headed and emotionally unstable. His personality no doubt had a major influence on his less-than-stellar reputation, as well as on the course of European history. The son of Victoria, Princess Royal and Prince Frederick William of Prussia and the grandson of Queen Victoria of England, Wilhelm II fathered six sons and one daughter through his marriage to Augusta Victoria of Schleswig-Holstein. His second marriage, to Hermine Reuss of Greiz, lasted from 1922 until his death in 1941. Wilhelm II frequently clashed with German Chancellor Otto von Bismarck and ultimately forced von Bismarck to resign his office.